A few days ago, I was watching Penn and Teller’s hit TV show, Fool Us. On the show, a magician named Steven Brundage performed a magic trick using a Rubik’s Cubethat blew away the audience. How is a Rubik’s Cube used in magic? 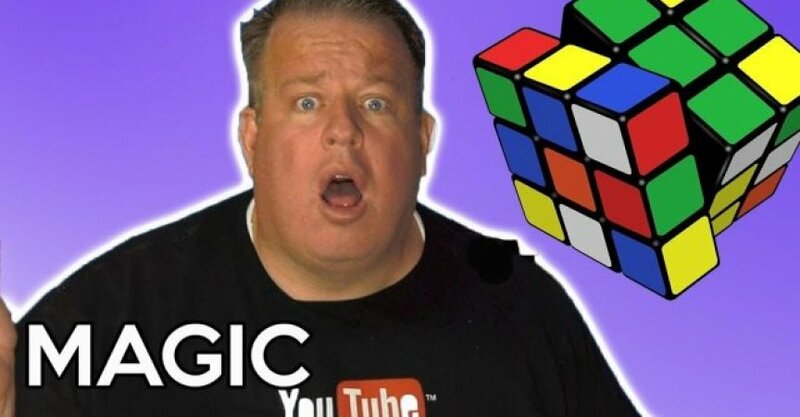 The classic Rubik’s Cube magic trick is to solve it instantly… faster than humanly possible. The magician literally throws the toy (randomly mixed) into the air and by the time he catches it, it’s solved. As you can see, it’s solved instantly. If you look at it over and over, you can see that he actually makes 4 moves. He can make moves to the cube directly in front of you and you wouldn’t notice a thing. First of all, let’s watch Steven Brundage perform the trick. And then we’ll dive into the details. Now… the reason this trick is so awesome is because Steven does not use a gimmick Rubik’s Cube, which is the traditional way it’s usually performed. Here’s the tutorial on how the basic trick works. As you can see, it’s a gimmick cube. That’s the classic way that the trick is done. He could perform that trick with any Rubik’s Cube according to his interviews. I think we can take his word for it considering he would not risk lying about it and then being called out and not being able to do a single trick. Also, Penn and Teller are sitting right in front of him. If he were using a gimmick cube, his other tricks would simple not have worked. But it doesn’t prove how Steven performed his version, and other things such as taking it out of the bag solved without even touching it. Or what about the last trick where both cubes are symmetrical with one another on all sides? Steven states that there was no switching going on. That means: There weren’t extra trick cubes hiding behind the table that he was switching around. But nobody’s that good… come on! This trick is killing me. The classic Rubik’s Cube technique makes a lot of sense. And can be added onto to perform a variety of more spectacular effects. But what Steven does is just…. there are no words. I can’t even fathom a guess. He does say in his interview that if he were to use trick cubes, every one of his tricks would look identical as they did when he wasn’t. But even as he points out these subtle hints, it’s impossible to tell just how he performed this trick without a gimmick cube. Thanks to PerryThePly, a reader of Rebel Magic for sending in this update! He’s found something that gets us closer to understanding how this tricks is done.